In order to delete a board, you'll need to close the board first. Closing a board is similar to archiving a card—you can leave it in your "Closed Boards" list if you think you might want to use it again some day, or you can delete the board permanently once it's closed. Deleting a board is permanent, and deleted boards cannot be recovered. Close a board by selecting "Close Board" from the board menu (open the menu, click the "More" button to expand the menu options). You have to be an admin of a board to close it. In Business Class teams, team admins can also close boards. Close a board from the board's menu. 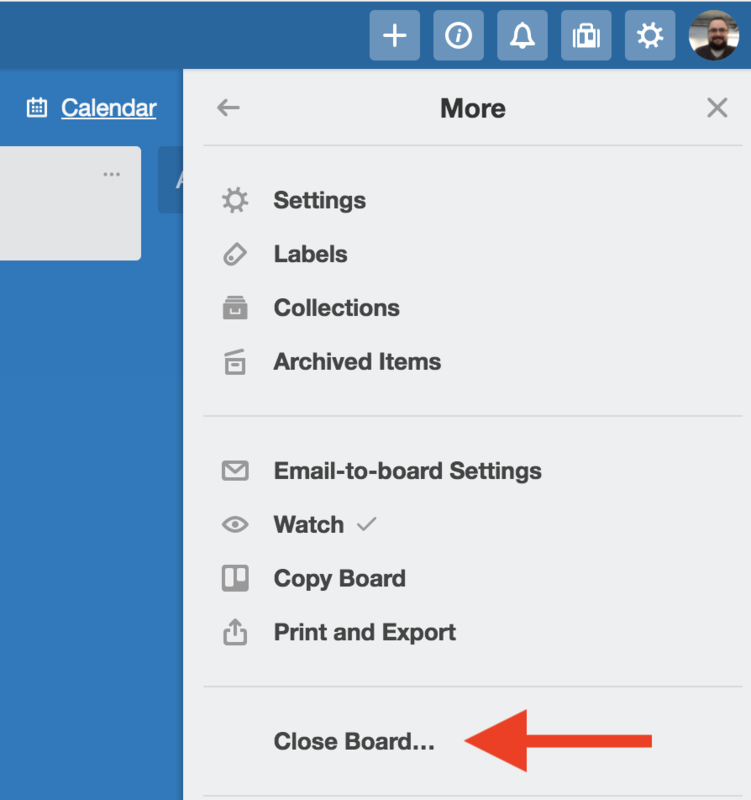 Once a board is closed, it is no longer visible in your Boards list and can only be accessed by clicking the Boards button at the top left of your Trello page and selecting "See closed boards..."
Access closed boards from your boards drawer. To delete a board that you've already closed, first open your Closed Boards list. From there, you'll see a list of your closed boards, with a "Delete" button next to the "Re-Open" button for any board that you're an admin for. You can click on that button to delete the board permanently.